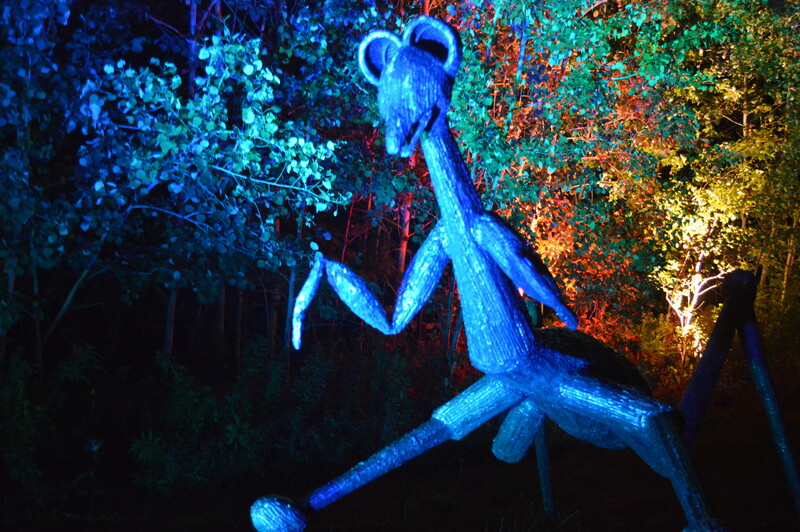 (East Otto, NY) For the sixth consecutive autumn, Griffis Sculpture Park will again be illuminated with colorful and theatrical lighting when “NIGHT LIGHTS at Griffis Sculpture Park” returns on September 12th. NIGHT LIGHTS will be open 17 nights for guests to view the interaction between lights, nature and art. The show has attracted over 7,000 visitors since 2013. 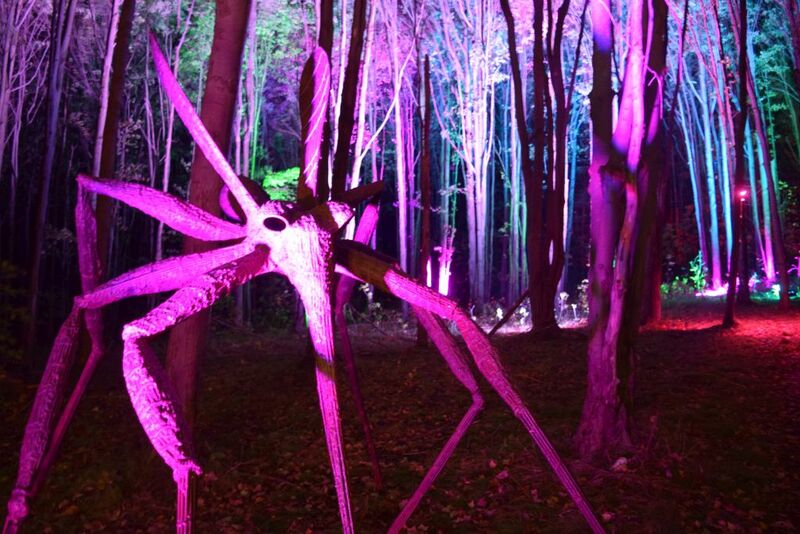 New additions to the trail this year are new lighting concepts, soundscapes, video projections and events. The trails will open from 7:30 p.m. to 9:30 p.m. on Weds. and Thurs. and 7:00 p.m. to 10:00 p.m. on weekends. The dates NIGHT LIGHTS will be open: Weds, September 12 to Sat. September 15, Weds, September 19 to Sat. September 22, Weds, September 26 to Saturday, September 29, Weds, October 3 to Sunday, October 7, 2018. Guests will be able to venture on an unguided walk through a portion of the Mill Valley Rd site of the sculpture park, where the trails and sculptures will interact with creative lighting – creating a truly unique experience. Guests are encouraged to bring flashlights for a few darker sections of the trail. Admission will be $10 adults, $5 children 12 to 7, and free for six and under. Night Lights can be canceled due to heavy rain. Updates will be provided at www.griffispark.org and Facebook account. 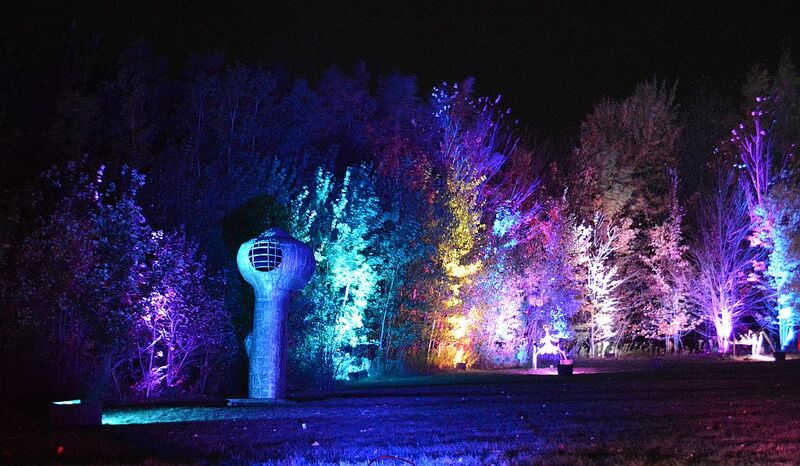 NIGHT LIGHTS at Griffis Sculpture Park is produced by SitlerHQ. The lighting and event company also produced the award-winning NIGHT LIGHTS at the Gardens (Buffalo & Erie County Botanical Gardens), NIGHT LIGHTS at The Heron (Sherman, NY), and NIGHT LIGHTS at Nannen Arboretum (Ellicottville, NY). They created their first NIGHT LIGHTS show in 2009. Over 250 sculptures reside at the 300 acre Griffis Sculpture Park, making it the United States largest sculpture park. The park is owned and operated by the Ashford Hollow Foundation, which also owns the Essex Arts Center in Buffalo, NY. The mission of the Ashford Hollow Foundation is to promote the visual and performing arts as well as construct a dynamic relationship between the arts and education in Western New York to better its young people and the greater community.